Told in rhythmical form, Animal Partners is a delightful book that shows the symbiotic relationships within the animal species. Some of the partnerships are shown of animals helping and depending on each other and some show how one animal wins in a relationship by hurting another animal. This is a book where children may not know right off hand what kind of animal partnership is being shown, but a further discussion after the reading will help them register and get the idea. The "For Creative Minds" section in the back of the book is one area that helps children decipher because it explains the difference between "win-win", "win-stay the same" and "win-lose" relationships between animals. 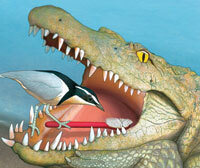 There's also a couple of fun matching exercises where readers can match animal partners and animal habitats. 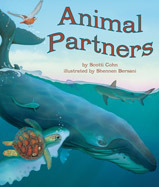 Animal Partners is a 2015 release by Arbordale Publishing. 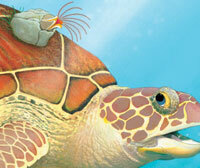 One person will win a book copy of Animal Partners. The giraffe is one of my favorites! I love schnauzer dog, Maggie! I am very fond of giraffes. They are a unique sort of animal. Penguins are my favorite animals! Giraffes are one of my fav's! Such amazing creatures! I love prairie dogs - they are sooooooooooooo cute! I have always loved rabbits since I was small! I LOVE my dog most, but I actually enjoy all animals and respect them-especially when they are little. I love hedgehogs. They're just so cute! My favorite animals are bears. Especially polar bears! I love dogs, but I would say to see from a distance I love to watch bears. I love otters. They are amazing and so fun to watch swim and play. I love to watch the polar bears at the zoo, they are so much fun.